The footage is devastating. 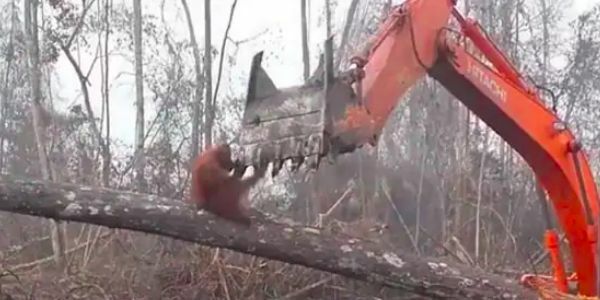 An orangutan runs across a felled tree and tries to fight off a bulldozer clearing his natural habitat in West Borneo. Members of International Animal Rescue are seen coming to the orangutan&apos;s aid. It's a heartbreaking reminder of the plight critically endangered orangutans face. Over the past 20 years, orangutans have lost 55% of their natural habitat due to deforestation. Their population has decreased 50% over the past 60 years, due in large part to this loss of habitat. All for the production of palm oil. Each year, 50,000 square miles of tropical forests are cleared to produce palm oil, which is then used in everything from household products to cosmetics to food. As a consumer, it can be challenging to find products that don't contain palm oil because it is so ubiquitous. Unfortunately, the more products we buy that contain palm oil, the more forests we lose. It's hard to make an impact with individual consumer choices, but what if stores took a stand and stopped carrying products containing palm oil? That could make a real impact. That's why we're calling on Trader Joe's to be a leader in the fight to save orangutans and stop selling products with palm oil now. Trader Joe's has a history of being progressive. The much-loved grocery store has been named one of the greenest companies, and it agreed to only sell sustainably-sourced seafood. Now, Trader Joe's has an opportunity to take a stand against disastrous deforestation. Please join in urging Trader Joe's to do the right thing and refuse to sell products containing palm oil today by signing this petition.